We know the museum can be overwhelming for younger students. There is so much to see and do! With kindergarten through third grade we focus on musical instruments and animals. Animals? In a music museum? Yes! Throughout our museum there are over 15 different animals. The animals are on outfits, logos, album artwork, pictures, the bus, and everywhere else! Every kindergarten through third grader will receive a clipboard with a list of animals, and it is their job to tell us where they found that animal. After the students finish their list they turn it into us and recieve their prize! For students in fourth through sixth grade we ask them to get with their friends, in groups of 2 or 3. Each group is given a clipboard with "trivia questions" on them. These questions serve as a guide throughout the museum and are all multiple choice. 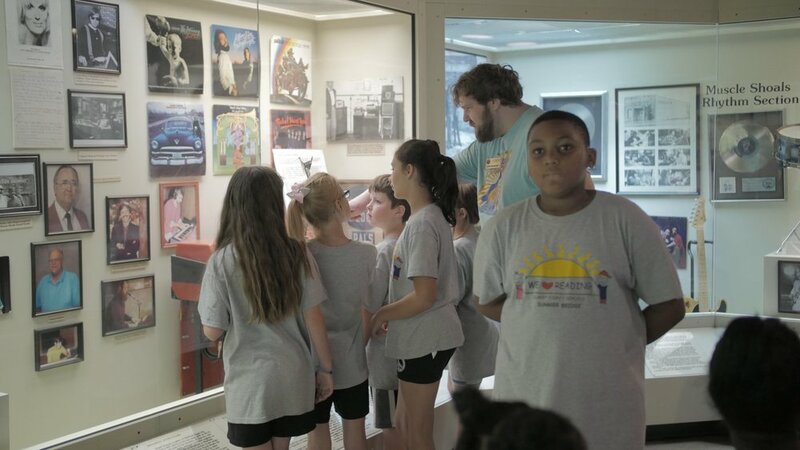 The trivia questions are broken down by area of the museum and the students can not move on to the next section until they have finished the one before. This helps the students work on their reading skill and it builds teamwork. Of course, they get a prize to after finishing their trivia. W.C. Handy is known as __________?